Lexington, Ky. – May 20, 2017 – Donning a commemorative blue ribbon on his hunt coat, Jeff Gogul earned another blue ribbon, piloting Sofia Roberts, LLC’s Snowbird to win the $5,000 USHJA National Hunter Derby sponsored by the World Equestrian Center and Kentucky Horse Shows, LLC. Entering the ring as the final competitor over a multiple option course designed by Danny Moore, Gogul upset Victoria Colvin’s commanding lead aboard Caliber, with a score of 184. Out of twenty-five entries in the Stonelea ring, only the top twelve combinations who scored an 80 or above in the classic round were invited back to vie for top honors and a pair of luxurious Fabbri boots. Gogul had an almost flawless first round aboard the 9-year-old Dutch Warmblood gelding, Snowbird, receiving an 86 from the judges. He also received four additional bonus points for taking all the high options. The score was high enough to position Gogul in first place going into the handy round, but Winn Alden and World Affair were not far behind with an 89. Heading into the handy round, Gogul had the advantage of going last in the order, but he knew they would have close competition. 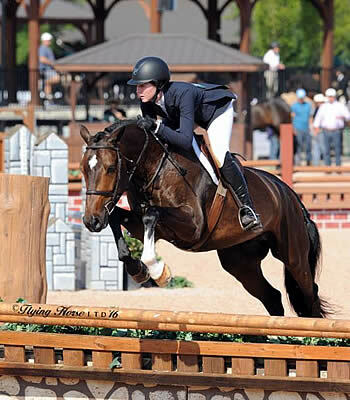 Victoria Colvin, who won the USHJA National Hunter Derby with Caliber during the Kentucky Spring Horse Show, was on track for another victory, rising to the top of the leaderboard with a high score of 92. As the final rider on course, Gogul was prepared with multiple plans after the trot jump at fence four. Calling upon the gelding’s bravery and natural jumping ability, Gogul guided Snowbird over all of the high options, earning them four extra bonus points. The pair received a score 90 from the judges, ensuring their victory in the class. Snowbird, who has spent the winter showing indoors at the World Equestrian Center, only started showing outside last week at the Kentucky Spring Horse Show. 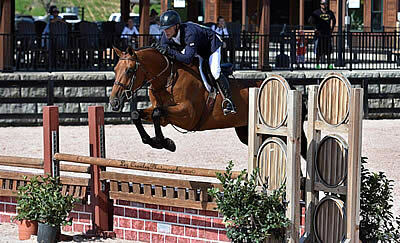 During that first week under Kentucky’s blue skies, the pair placed fourth in the $5,000 USHJA National Hunter Derby. Gogul not only came into the ring prepared to win but he felt the added presence of his beloved friend, Ellen Veitch, whose memory was honored by spectators, riders and show organizers alike with ‘A Day in the Park.’ As he took his victory lap, blue braids standing out in Snowbird’s mane, Gogul reflected on what a perfect day it was to honor his friend who loved her home state of Kentucky and horses equally. Victoria Colvin secured the second place honors with a score of 179 aboard Laura Karet’s Calibur. Winn Alden scored 178.5 aboard World Affair, owned by Southern Arches, LLC. Samuel Parot and Quick Du Pottier. Photos ©ManciniPhotos. Wellington, FL – December 2, 2016 – Samuel Parot (CHI) and Quick Du Pottier rose to the challenge in the $35,000 Dever 1.45m Classic at Palm Beach International Equestrian Center (PBIEC). The pair raced through the timers to complete their course in 59.22 seconds for the win. Eduardo Menezes (BRA) and Carushka collected second place with a time of 60.36 seconds, while Richie Moloney (IRL) and Alsvid earned third after securing a time of 61.12 seconds. Parot and his own Quick Du Pottier, a 2004 Selle Francais gelding (Hurlevent de Breka x Cuba), topped the class of 45 entries with the quickest time of the day, making easy work of the course designed by Anthony D’Ambrosio (USA). Parot is an expert at navigating the quickest path around the track as a notoriously fast rider. He noted that he felt he made up the second separating him and Menezes in his approach to the final combination. “I made the turn to the last combination very close and it rode very well. I believe that is where I made the difference,” he said. Quick Du Pottier and Parot have traveled across North America this year, competing on the West Coast, as well as in Canada, most recently picking up an FEI win in Calgary this past October. After the conclusion of this week’s competition, Parot will give Quick Du Pottier a vacation until the middle of the Winter Equestrian Festival (WEF) circuit, where the pair will debut during one of the CSI 5* weeks. Victoria Colvin of Loxahatchee, FL guided Regent RCF to top honors in the $5,000 USHJA National Hunter Derby, besting a large class of talented entries. The pair earned a two round score of 171 for the win ahead of Skyler Fields of Wellesley Hills, MA and Duplukato, owned by Donald Stewart, who finished in second place with a total score of 164. Grace Boston of Owings Mills, MD and Amazone De La Cense, owned by Plain Bay Farm, collected third place honors. Colvin, a household name who has garnered many of the most prestigious accolades in the hunter discipline throughout her career, piloted another mount to the winner’s circle after collecting a first round score of 86 and a second round score of 85. Fields, who followed in second, captured the highest score of the day in her handy round aboard Duplukato, receiving an 89 from the judging panel. The class hosted 18 entries and marked the first USHJA National Hunter Derby of the 2016 ESP Holiday Series, which will continue through the first week of January. Grace Boston, who was presented with third and fourth place honors, piloted three different entries, the most of any rider in the class. Richie Moloney and Slieveanorra. Photos ©LizCrawleyPhotography. Mill Spring, NC – July 22, 2016 – Capturing their second victory in a two-week span, Richie Moloney (IRL) and Slieveanorra earned another victory in George H. Morris Arena, this time in the $35,000 1.45m Horseware® Ireland Speed Stake at Tryon International Equestrian Center (TIEC). Moloney and Slieveanorra crossed through the timers in 56.09 seconds to push Samuel Parot (CHI) and Atlantis to second place, as the pair finished in 56.30 seconds. Emanuel Andrade (VEN) and Bon Jovi captured third place honors, completing the track in 57.67 seconds. Catsy Cruz (MEX) is the course designer for this week’s FEI tracks in the George H. Morris Arena and is known for her strong building technique, which asks riders questions of technicality and quickness in each class. Moloney and Slieveanorra rode a neat and fast round, which placed them atop the leaderboard. With 21 combinations contesting the track, Moloney had the advantage of tackling the course last in the order of go, already piloting his other mount Alsvid through the course. Seven pairs rode to finish with fault-free trips, but Moloney left everything on the line, entering the ring with an understanding that he would need to best the 56.30 seconds earned by Parot. When Moloney walked the course, he felt that while there were more efficient options available, he preferred to stick with a fast and straightforward approach, ultimately paying off with a victory. “He always has a chance because he jumps up, but doesn’t waste time in the air. I thought that there were a couple of options to leave out strides and we didn’t even need to do that because it still worked out well,” he explained. The 2002 Irish Sport Horse gelding (Voltaire x Flagmount Diamond) owned by Equinimity LLC, has been a staple in Moloney’s string for a number of years and performs with a sense of consistency and strength that make him an invaluable member of the top competition team. Moloney will look to continue his success throughout the week as top mount Carrabis Z is entered in the $216,000 Tryon Estates Grand Prix CSI 4* Saturday evening, while Alsvid and Slieveanorra will both contest the $35,000 1.50m Suncast® Classic on Sunday, July 24. Looking forward to a rest for the horses in the coming weeks, but also already preparing for a strong fall campaign, Moloney reflected on his team’s success so far this season. “I’m just pleased that my horses are all going well. We’re picking up good results at almost every competition and going forward I think we’d like to keep that,” he said. Danielle Grice of Mufreesboro, TN and High Life, owned by Allison Reichenbach, rode to victory in the $10,000 USHJA National Hunter Derby at TIEC, taking the class with a two round score of 121. Morgane Qualls of Mufreesboro, TN and Limousine, owned by Julie Burton, took second place honors with a score of 163, while Jillian Briggs of Wellington, FL piloted Roc Du Triomphe, owned by Barry H. Carragher, to third place, receiving a 156. Grice and High Life, a flashy dapple grey gelding, impressed the judges, earning the two highest scores of the class with an 87 in the first round and an 84 in the handy. High Life plays dual roles as he is ridden by owner Allison Reichenbach in the Adult Amateur Hunter divisions and then transitions to Grice for the larger classes. “The handy round had some great options, which I think really showed off his highlights,” she added. Grice and Reichenbach have been working with High Life for a year now, as they purchased him from Chad Keenum and have been competing him since, specifically with Reichenbach who competes in the amateur classes. “He’s been doing the First Year Greens and we’ve kept him at the 3’3″ height to preserve him for next year. He’ll start doing the bigger classes and larger derbies, and Allison will also step him up in the amateur classes too,” explained Grice. The pair who rode two elegant and smooth rounds, finished well atop the leaderboard, which helped them to gain needed experience for what Grice hopes will be a successful fall campaign. Competition at TIEC continues Saturday featuring the highlight class of the week with the $216,000 Tryon Estates Grand Prix CSI 4*. Gates open to the public at 6:00 p.m., while entertainment will begin at 7:15 p.m. Competition will commence at 8:00 p.m. For more information on TIEC and to see a full list of results, please visit www.tryon.com. Ali Wolff and Caya. Photos ©LizCrawleyPhotography. Mill Spring, NC – July 15, 2016 – Ali Wolff (USA) and Caya dominated in the $35,000 1.45m Horseware® Ireland Speed Stake CSI4* at the Tryon International Equestrian Center (TIEC), exemplifying speed and agility with a remarkable time of 61.42 seconds. Trailing not far behind Wolff and earning second place honors was Sharn Wordley (NZL) and Famoso D Ive Z with a time of 62.81 seconds, also winners this week in the $35,000 Horseware® Ireland Opener CSI 4* earlier in the week. Third place was awarded to Todd Minikus (USA) and his mount, I Am Nala, with a time of 63.95 seconds. Wolff and Caya (Carolous I x Lancer II) have been partners for almost four years, growing together as a team since she took over the ride. Wolff consistently showed Caya in the high amateur classes and brought home multiple wins. During their campaign, the numerous and accumulating wins led Wolff and her team to the decision to step Caya up to the FEI level. Along with impressive inside turns, Wolff touched on her horse’s athletic abilities. Wolff believes that Caya’s talent shines in the speed classes as the mare is quick off of her feet and very adjustable around courses, especially those that offer multiple tracks and opportunities. This is Wolff’s first victory at TIEC this season and it came at the right time, as the rising star for the United States has found herself in every position but the winner’s so far during her time at the venue. Wolff and team will stay to contest the remainder of competition this week, as well as for the CSI 4* to be hosted next week. Steve Heinecke of Charlotte, NC and Hercules VD Vromboutshoeve, owned by Freedom Group, rose to the top of the class in the $10,000 USHJA National Hunter Derby, earning a two round score of 181. Madison Johnson of Matthews, NC and her own Ferrari earned second place receiving a 172, while Josh Dolan of Wellington, FL and Hidden Lane, owned by Page Tredennick, collected third place, finishing just behind Johnson with a score of 171. Heinecke and “Hercules” took the class by storm, collecting a score of 91 in the first round to then return for the handy to earn a 90. Hercules recently transitioned from the jumper ring to the hunter ring and Heinecke has been impressed with his willingness and attitude, which has helped him to excel in the derby classes. “Each week he just keeps getting better and better. He came in third in the last derby and you know, he’s never had to trot a jump in the ring before and has handled it all so well. He’s just been so nice to ride,” he added. Hercules VD Vromboutshoeve is co-owned in partnership by Heinecke and good friend Laura Kraut, as the pair typically invests in two horses a year together. While the gelding may be new to the discipline, he’s shown that he’s willing and able to score well against some of the best combinations in the country, and Heinecke is hopeful that he will turn into something very special. Heinecke, who is based in Charlotte, NC during the spring, summer, and fall months, is thrilled with the opportunity to compete at TIEC, which has drastically impacted the growth of his business, as horses of all ages and experience levels benefit from the competition. Competition continues Saturday, July 16, featuring the third week of the third installment of the “Saturday Night Lights” Series of the 2016 Tryon Summer Series presenting the $216,000 Hollow Creek Farm Grand Prix CSI 4* with gates opening to the public at 6:00 p.m. and entertainment beginning at 7:15 p.m. Competition will commence at 8:00 p.m. For more information on TIEC and to see a full list of results, please visit www.tryon.com. The $2,500 USHJA National Hunter Derby, sponsored by Geddaway Farm, was the featured hunter event Friday night and 34 horse and rider teams took to the course designed by Allen Rheinheimer of Zionsville, Indiana. Tim Maddrix of Leeds, Alabama and Missy Nolen’s Shutterbug led the first round with a score of 91 and combined with their second round score of 88, for a total of 179 points, found themselves in the winner’s circle! Southland Stables’ End Game, ridden by Christina Jason of Aiken, South Carolina, earned second place honors with a first round score of 85 and a second round score of 84 for a total 169 points. Third place honors went to Fit to Print Farm’s Homepage, ridden by Holly Sims of Atlanta, Georgia, with a Classic round score of 84 and a second round score of 80, for a total of 164. Lord Baltimore, owned and ridden by Katie Ramsey of Mount Juliet, Tennessee, placed fourth after earning a first round score of 83.5 and a Handy score of 79 for a total of 162.5. Barn Rat, LLC’s Nobel Laureate, ridden by Erika Jakobson of Boca Raton, Florida, placed fifth after earning a first round score of 78 and a second round score of 82 for a total of 160 points. Matt Martin of Petersburg, Tennessee rode Karen Kogon’s Casino Royal to the sixth place ribbon after earning a first round score of 86 and a Handy score of 72 for a total of 158. 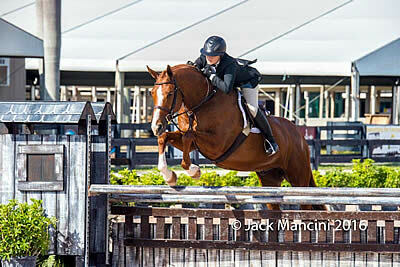 Pumpkin Patch Farm’s Vermeer, ridden by Emmanuelle Greenberg of Boca Raton, Florida, earned a Classic score of 78.5 and a Handy score of 76 for a total of 154.5 which saw them finish in seventh place overall. Eighth was awarded to Gene Cone’s Cash in Hand, ridden by Alex Joerg of Collierville, Tennessee, after earning a first round score of 80 and a Handy score of 74 for a total of 154 points. Martin returned for the ninth place ribbon in the irons of Jessica Dicampli’s Sparticus after earning a first round score of 77.5 and handy score of 76 for a total of 153.5 points. Jason returned for the tenth place ribbon in the irons of Carline Clark’s Caballero after earning a Classic score of 84.5 and a Handy score of 68 for a total score of 153.5. 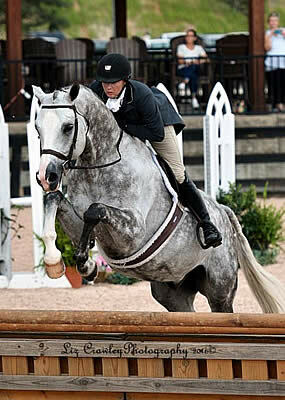 Liza Thompson’s Promise, ridden by Eliza Hay of Johns Island, South Carolina, took eleventh place honors after earning a Classic score of 82 and a 64 in the Handy round for a total of 146. Lalique, owned and ridden by R. Meggin Patterson of Malvern, Pennsylvania, wrapped up the class with a twelfth place finish. Rachel Kennedy and Timberline. Photos ©LizCrawleyPhotography. Mill Spring, NC – July 8, 2016 – Rachel Kennedy of Brookeville, MD and Timberline, owned by Sarah Brooks, captured an emotional win in the $2,500 USHJA National Hunter Derby at Tryon International Equestrian Center (TIEC). Kennedy and Timberline earned a two round score of 178 to take the victory ahead of Hayley Iannotti of Wellington, FL and Vermeer, owned by Pumpkin’s Patch Farm, LLC, who finished with a score of 173. Steve Heinecke of Charlotte, NC piloted Hercules, owned by Freedom Group, to round out the top three finishers and received a 172.5. Kennedy and Timberline collected a score of 89 in the first round of competition, which placed them second behind Heinecke and his mount, Pamina, who earned a 90 moving into the handy. Timberline, who excels in the handy portion of competition, completed an effortless round filled with smooth roll back turns and an athletic and adjustable presence, which ultimately secured the win, as the pair earned a repeat score of 89. Kennedy and Timberline have cultivated an incredible relationship and the duo have accumulated a number of top finishes, but Friday’s win turned into both a memorable and special class, as Timberline will likely move on to a completely amateur-focused career with owner Sarah Brooks. “His first derby win was in 2010 in State College and he’s been winning ever since. That’s all I do with him is the derbies. 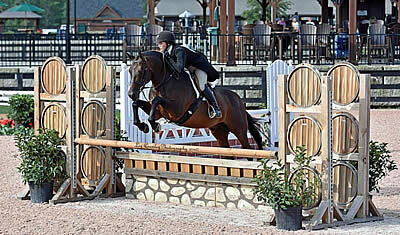 His owner Sarah Brooks does the Adult Hunter and he’s great for both of us,” explained Kennedy. “I always say that Timberline is like my secret boyfriend,” she laughed. “He makes the world better, no matter what; if you sit on that horse the world just becomes a better place,” she said, as she reflected on the duo’s career together. It slowly began to hit Kennedy that their win may have capped an incredible derby career together, which has been a joyous journey for all involved including horse, rider, and owner. “He totally knows when we’re doing the derby and will jump pretty much anything. That’s what makes him so special. He got two scores of 89 and I just don’t know if you can top that. If I let him do it forever he would,” she concluded. Competition at TIEC continues Saturday with the $5,000 Pony Hunter Derby in the George H. Morris Arena, kicking the competition off at 8:00 a.m. The $130,000 Wellington Equestrian Realty Grand Prix CSI 3* will begin at 8:00 p.m. while gates are set to open at 6:00 p.m. For more information about TIEC and to see a full list of results, please visit www.tryon.com. Tim Maddrix of Birmingham, Alabama rode Holly Labry, LLC’s Riverside to the win the $2,500 USHJA National Hunter Derby, presented by Legend, besting a field of twenty-seven horse and rider teams. Maddrix himself rode five of the horses and earned ribbons for four of them! Maddrix and Riverside earned the highest score of 92 in the Classic round, followed by Naddel, owned by Hilary Baylor and ridden by Daniel Geitner of Aiken, South Carolina, who earned a first round score of 90. Sitting in third position before the Handy round was Face Time, owned by Harris Hill Farm and ridden by Jennifer Bliss of Wellington, Florida. The pair earned a Classic round score of 87. Sitting in fourth position after the first round was Maddrix and Holly Labry, LLC’s Red Rooster with a Classic score of 86, and Aaron Vale of Williston, Florida and Aberdeen Ventures, LLC’s Madewell sat in fifth place after posting an 85 in the Classic round. Geitner and Geddaway Farm’s Bella Vida found themselves in sixth place with a score of 82, and Maddrix and Cheryl Rubinstein’s Capisce placed seventh in the Classic round with a score of 81.5. Maddrix and Missy Nolen’s Favorite earned a first round score of 81.25 in the Classic round and sat in the eighth position, while Louise Petz’s Wellington, ridden by Megan Wexler of Reddick, Florida, earned a Classic score of 81 and sat in ninth position. Elbo VDL, owned and ridden by Angela Pollex of Troutman, North Carolina, sat in the tenth position after the Classic round with a score of 80.75, and Frances Robinson’s Relax Jack, ridden by Wexler, sat in eleventh place with a Classic score of 80.5. King Bee, owned and ridden by Louisa Brackett of Grayslake, Illinois, sat in twelfth place after the Classic round with a score of 80. Maddrix and Favorite were first to go in the Handy round and earned a score of 44. Their overall score of 125.25 would see them finish in eleventh place overall. Pollex and Elbo VDL followed Maddrix and Favorite, earning a second round score of 77 for a combined total of 157.75 and an eighth place overall. Wexler and Relax Jack were next in the order and earned a Handy score of 69 and a combined score of 149.5 for a ninth place ribbon. Geitner and Bella Vida earned a second round score of 84 and a combined score of 166 which would see them move into a fifth place finish. Maddrix and Capisce followed in the order and earned a Handy score of 86 for a combined total of 167.5 and moved up to finish fourth place overall. Louisa Brackett and her own King Bee followed in the Handy order and earned a score of 85 for a combined 165 which moved them up to finish in sixth place overall. Bliss and Face Time sat in third place after the Classic round, but a Handy score of 33 earned them an overall score of 120 and the pair finished in twelfth place overall. Maddrix and Red Rooster sat in fourth position after the Classic round, but their Handy score of 90 for an overall total of 176 moved them into second place overall. Geitner and Naddel moved from their second place position after the first round to third after earning a Handy score of 84 and a combined score of 174. Wexler and Wellington sat in ninth place after the first round, but after earning a Handy score of 49 for a combined total of 130, finished in tenth place overall. Vale and Madewell earned a Handy score of 78 and a combined 163 for a seventh place overall finish. Maddrix and Riverside sat in the first position after the Classic round and their Handy score of 92 for a combined 184 would see them hold their lead and take the win.